Panna cotta has its origins in Piedmont, but it is now commonly found in restaurants in other regions of Italy such as Tuscanyand Umbria. 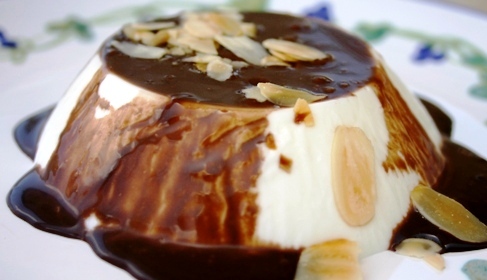 In Piedmont, it was traditionally made with cream and thickened with egg whites (rather than gelatin) then baked in a bain marie with a caramel sauce. This is a laborious and somewhat tricky process. You’ll find it’s much easier to make panna cotta with gelatin, which does not require baking, so the recipe is simple and quick. Though rich, panna cotta should be a small serving, and is an exquisite little dessert when done right. Too often, the panna cotta served in restaurants in Italy is rubbery or has separated, leaving a slimy film of gelatin on the bottom. 1. Use just enough gelatin so that the panna cotta holds together- it won’t be rubbery. 2. Cool the panna cotta over ice until it begins to gel. This will keep it from separating. In Italy, gelatin comes in sheets, so that is what I have used in my panna cotta recipe. 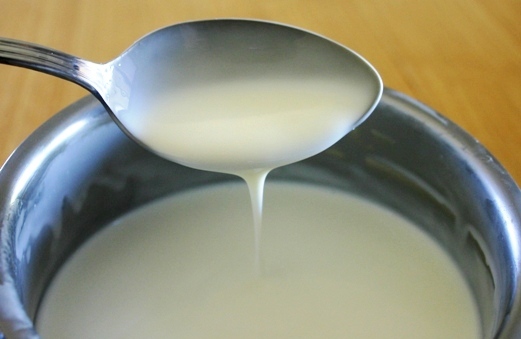 The finishing touch to panna cotta is the sauce, which should complement the delicate cream. 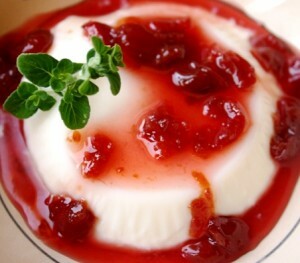 Fruit: A tart fruit sauce made with berries, or amarene (sour cherries) is an excellent contrast to creamy panna cotta. Chocolate: For those who simply cannot forgo dessert without chocolate, a dark chocolate sauce is a luscious accompaniment to panna cotta. Caramel: A simple caramel sauce made from sugar and water is a good bitter-sweet complement to panna cotta. My recipe for panna cotta was adapted from one I learned on a walking & cooking tour in Umbria at La Palazzetta del Vescovo – grazie mille Paola! Where do you get the gelatin sheets to use for your Panna Cotta? 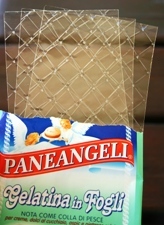 Since I live in Italy, I commonly find gelatin sheets in a grocery store. If you are in the USA, you might try mail order at gelatin innovations.com Let me know how your panna cotta turns out! Hi Miranda -Sorry I didn’t get back to you before the 4th – maybe you made the panna cotta? There is also a recipe for an easy crostata di marmellata that you find via the blog search feature. Happy baking! Could you please tell us what strength of gelatin sheet you used. Silver? Gold? Bronze? Thank you. My gelatin sheets do not have any “strength” noted on them. I just use the standard kind found in an Italian supermarket.